Let's help Special Counsel Robert Mueller understand what We the People are demanding! Everyone who meets this guy will be happy for a chance to perform a Citizen's Arrest. Take your pick from the long list of arrestable offenses. Snap your pictures, then upload them to our site where we will forward your message to Robert Mueller. 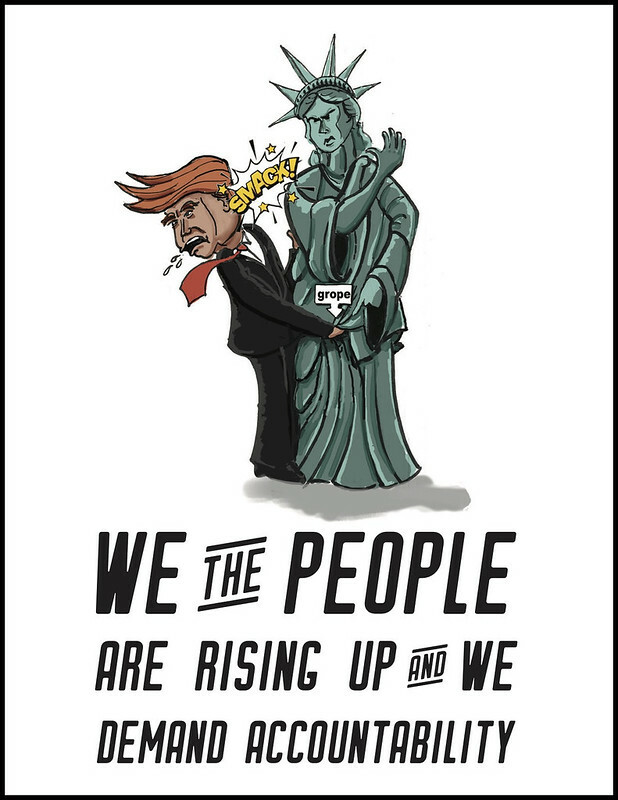 Resist Trump's assault on our liberties and society's slide towards tyranny. With the equivalent of a renegade corporation at the helm of the highest office in the land, we've got to pull out all the stops. It's time to Make This Head Roll! Get on the tour schedule now! Use these"Impeach Trump Accountability Cards" for your action! Call 360-551-6944 or email Jo (jo@backbonecampaign.org) or fill out the form below. Build the movement demanding Trump's impeachment! We've got a few thousand Trump cards that make the case for his impeachment and have the awesome cartoon on the opposite side (see it below). Contact Jo to order your cards today! Your shipping box will arrive with the papier mache head, jailbird suit and teeny tiny hands. Whether you're borrowing a Trump Head or think it's a great idea, Pitch In HERE toward the cost of shipping this head across the country!